One of those things that the article discusses as something that basketball teams do a lot is closeout. 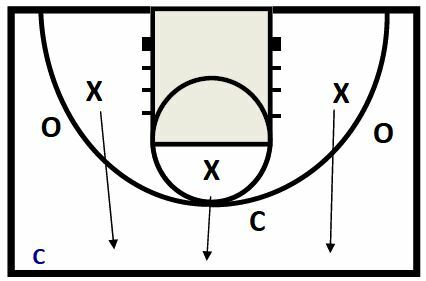 These three basketball drills are designed to give you some variety as you drill closing out. All of this information came from Coach Neighbors weekly basketball coaching email newsletter. If you are interested in being added to his list, let me know and I will forward your email address on to Coach Neighbors. I will post the remainder of the drills next week. Again, these drills are attributed to University of Washington Women’s Head Coach, Mike Neighbors. Position 3 chairs along each sideline. We place a ball in the seat of each to simulate that chair as a player being a ball handler. Coach on each side between the chairs. Coach with ball passes across court to other coach. Defensive players that were in “help” sprint to close‐out to the chairs on the AIR TIME of the pass. 1) Move on the Air Time of the ball: a great defender moves from position to position while the ball is in the air. The ability of each offense player effects each defenders close out. If we are closing out to a player who can stroke the 3 but can’t score off the bounce, we will close out a little tighter. If the opposite is true, the hands will still be high to take away a quick post pass but the close out with shorter to take away catch and go drives. Another good way to work on the all important technique of closing out on defense. Also simulates good transition defense and places premium on talking and communicating. Three X defenders in triangle around basket. Coach initiates action with pass to the wing. All defensive players close out and we play moving the ball from side to side then coach takes a shot. Defense has three on two advantage so we hope to get every rebound. 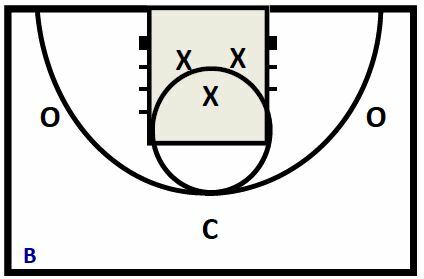 On the rebound and or a steal before the shot goes up, the three X players become offense and go in transition 3 on 2 against the O players minus the coach. You can make this competitive by scoring the offense and splitting into two teams. Teach the techniques you teach on closeouts, defending on ball, and rebounding. Coach bounces the ball to initiate drill. On the bounce the defense slides to touch hands then back to their GAP.